Maggie on her second groom. The first time we got most of the undercoat out but her second groom it all came out. Even though she's a big shaggy collie you can run a comb through her entire coat without it catching on hair. 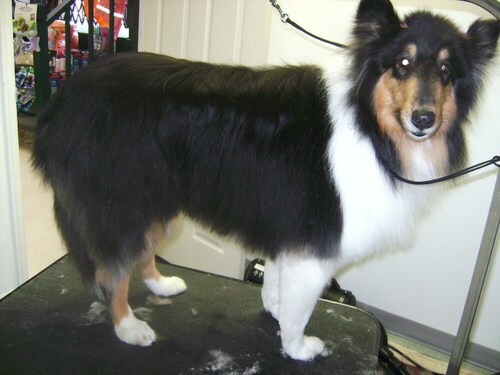 Maggie is a great example of how regular grooming can really make all the difference in your pet's coat. Maggie will be cooler and more comfortable this summer. Plus it's easier for her owners to brush her out and remove twigs after a romp in the woods.